Provide comfort for the family of Michael Blair with a meaningful gesture of sympathy. 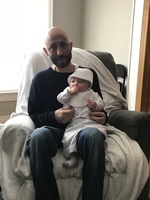 Michael P. Blair, 36, of East Syracuse passed away March 20. He was born and went to high school in East Syracuse Minoa. Surviving are his parents, Deborah LaCroix and Randye Blair; sons, Brendan Blair, Shaun Eddy and Isaiah Blair; sister, Mandye Blair; sister Nicole Hurley; brother Tyler Blair; A maternal grandmother Alice Somers; a Paternal grandfather Ronald Blair and several aunts, uncles, cousins, and nephew Jonathan Warren. In lieu of flowers contributions may be made to The Upstate Cancer Center. Michael, you were not only my cousin but like my brother. I miss you so much! I will always love you and will always remember the great man you were. I'm not sure I will understand why God took you from us. I not sure I will ever get over this loss.